All of the Steel SQ 400 Speaker Stand Range are manufacture by the craftsman at Custom Design. The hand made and finished design includes 4mm welded inserts combined with M8 fixing bolts for total integrity. Hand polished steel plates and support columns reflect the attention to detail and standards of quality that Custom Design provide to all of their customers, we are manufacturers. The SQ 400 Steel Range are designed with 50mm square columns which can be mass loaded easily with INERT FILLER. This will help prevent resonance from transmitting through the design and influencing the stands sound performance. The range is available in 610mm (24”) as standard but custom heights are available. 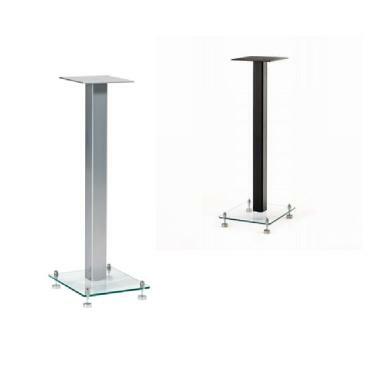 The glass bases are an optional extra and provide an asethetically pleasing support or standard Steel Bases in Black on all finishes except The (all) Mercury Silver Option. The 6mm Clear Glass Bases are manufactured to British Safety Standard ( BS 6206 ).